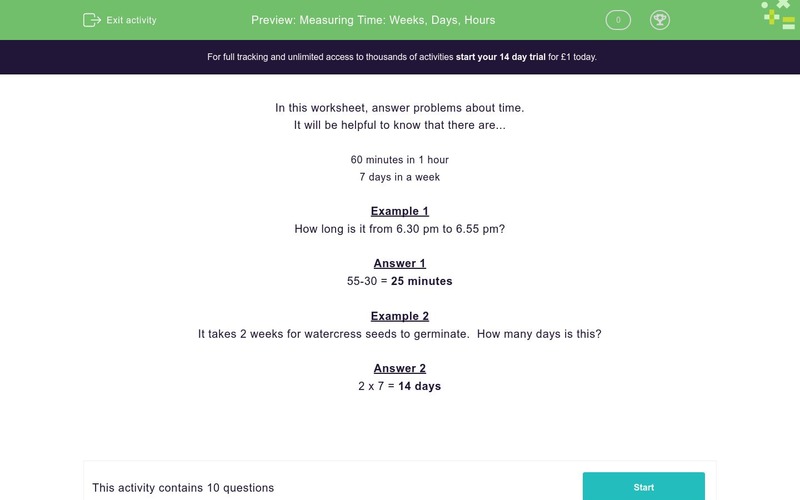 In this worksheet, students answer word problems relating to time. In this worksheet, you must answer problems about time. It takes 2 weeks for my seeds to germinate. How many days is this? I go on holiday to Spain for three weeks. How many days is this? My maths lesson starts at 2:30 pm and ends at 3:05 pm. 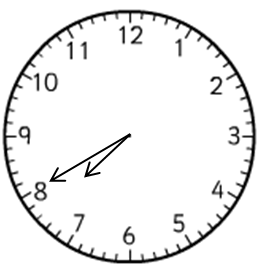 The time is as shown on the clock. My bus leaves at 8 o'clock. In how many minutes is this? These clocks show the start and end times of break. How long does break last? I leave school at 4.20 pm and it takes me 40 minutes to get home. At what time do I arrive home? It usually takes me 35 minutes to do my homework. Yesterday a spaceship landed in my garden and it took me twice as long. How long did it take me to do my homework yesterday? Jack and Jill go up the hill. Jill is 3 minutes faster. How many minutes does it take Jill? It takes 3½ hours for my spaceship to go from Earth to the Moon. If I leave Earth at a quarter past 3, at what time will I reach the moon? It takes 13 minutes to cook a pizza. How many pizzas can I cook in an hour if only one pizza fits in to my oven at a time? The film Ice Age lasts 81 minutes. I need to go out in 1½ hours. Do I have enough time to watch it?